When it comes to driveway placement there are four main considerations: safety, access, drainage and aesthetics. First and foremost, a driveway must be functional and if placed incorrectly on your property it may not function correctly or could become a safety hazard. Once function is addressed it is time to think about how your driveway will look on your property because the placement of a driveway will drastically impact the overall appearance of your home. The most important driveway placement consideration is safety. Drivers need to be able to enter and exit your driveway easily for safety reasons. This means that where the driveway meets the street there needs to be good visibility. Also, it is best to avoid placing the driveway entrance near a corner or high traffic area. It is also a good idea to keep your driveway a reasonable distance from your neighbors' driveways. Access is the second most important consideration when deciding on the ideal placement of a driveway. Typically, a driveway must conveniently access three points: the garage, the front door and parking. If needed, a walkway can be used to usher guests from the driveway or parking area to the front door. Pro Tip: Always provide a walkway from the driveway to the front entry. Even when you have a fancy grand entrance to a home, the first guests that arrive to the party often park in the driveway, especially if they are family members. Also, this walkway is handy when unloading groceries or larger purchases. The durability and lifetime of a driveway is increased when properly placed in a high and dry location. Areas with poor drainage and wet soil provide a weak sub-base for a driveway that will not be able to support vehicle traffic. This often results in the driveway crack or sinking and becoming uneven. If you have an existing driveway with poor drainage, consider these driveway drainage solutions. Finally, how the driveway will look must be considered. 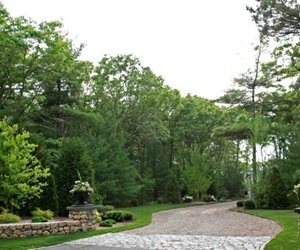 A driveway should be located in a position that accentuates both the home and the landscape. 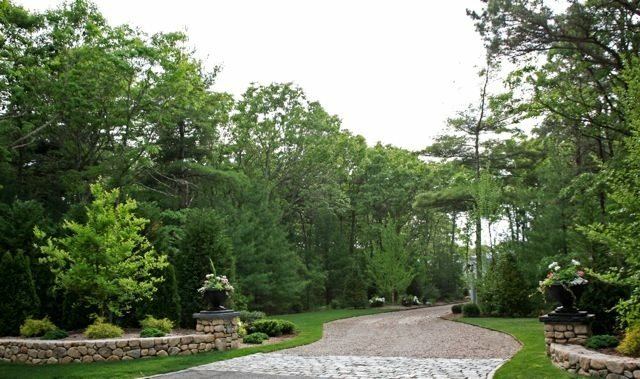 Placing a driveway right in the center of your front yard can often have a dominating effect. In order to avoid this, many designers place the driveway off to one side.